Wild and Scenic On Tour brings together a selection of short films that tell a story about our planet, our beautiful and precious wild lands, and the people of the communities who love and defend them. They open our eyes and hearts to fantastic experiences in remarkable places. They beckon us towards action, highlight issues, and provide solutions. There will be 9 different films shown. The show will feature Dying Green. Set in the foothills of the Appalachians, this film explores one man’s vision of using green burials to conserve land. The efforts of small town physician Dr. Billy Campbell have radically changed our understanding of burials in the United States. Dr. Campbell’s dream is to conserve one million acres of land. Wild Virginia will also be showing Return to the Tepuis. “I hear the most beautiful sound in the world,” says Dr. Bruce Means. Referring to the call of a toad that he and his expedition team – North Face Climber Mark Synnott and National Geographic contributing photographer Joe Riis — travelled to the tops of the Tepuis of South America to find. Means has a hypothesis that he calls a paradigm and this little toad is the missing link. Braving the elements and first time repels into crevices will they find the illusive pebble toad. Door Prizes and Raffle: There will be a raffle for a framed print of an enormous 1,600 year old redwood tree generously donated by National Geographic photographer, Michael ‘Nick’ Nichols. Everyone who attends will be entered to win door prizes from sponsors. Discount Memberships: Wild Virginia will be offering special discount memberships at the door. Wild Virginia is a grassroots nonprofit organization dedicated to preserving wild forest ecosystems in Virginia’s National Forests. 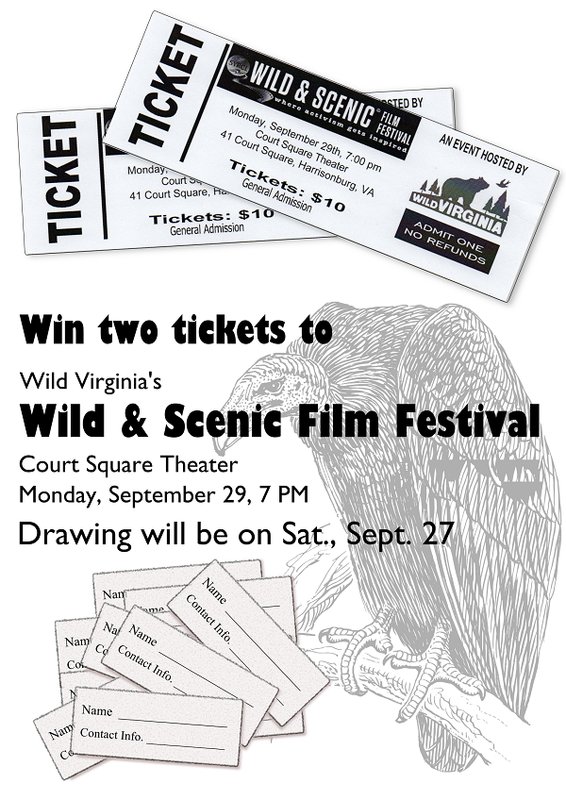 The Climate Action Alliance of the Valley is offering a free drawing for two tickets to the 2014 Wild & Scenic Film Festival! Saturday, September 13 at the Harrisonburg Farmers Market 8:00AM – 1:00PM. Saturday, September 13 at the People’s Climate March Pre-Rally: Changing Everything Takes Everyone at Community Mennonite Church, Harrisonburg, 4:00-6:00PM. Saturday, September 20 at the Harrisonburg Community Engagement Summit, First Presbyterian Church, Court Square, 10:00AM-4:00PM. Saturday, September 27 at the International Fest, Hillandale Park, 12:00-6:00PM. The drawing will be held at the end of the tabling event at the International Fest. The tickets will be available to the winner at the Film Fest on September 29.